I began working on invasive species issues on islands almost 25 years ago, helping to protect native birds by trapping and removing mongooses and other predators from the cloud forests in Hawai’i. At that time, climate change was a topic in the classroom and between scientists but not the headline news it is today. Little did I know that the tools for conservation I began learning in the forests of Hawai’i decades ago would become so relevant in the face of climate change, which many now consider the greatest threat to biodiversity. Ecosystem and species resiliency is a key aspect of countering the impacts of climate change, and healthy ecosystems and abundant species populations will be more resilient and able to withstand climatic changes and rising sea levels. 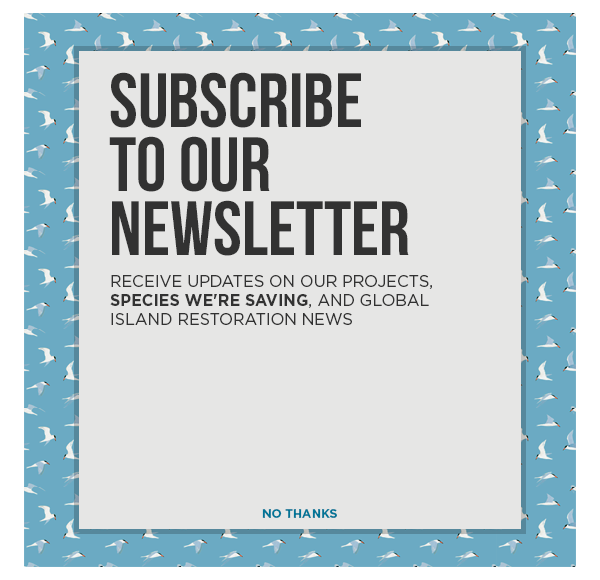 One the most effective ways to restore ecosystems and create healthy species populations, particularly on islands, is to remove invasive species. This is the story that the Switzer Foundation has shared in their recent newsletter. As a past Switzer Fellow, I am grateful for the support they provided me as a graduate student studying the impacts of invasive species on islands. As an alumnus, current member of the Switzer Network, and a father of two young boys, I am excited to watch the Foundation continue to promote new Fellows studying the impacts of and looking for solutions to climate change. Thank you Switzer Foundation! Brad Keitt has conducted research on all of the Baja Pacific Islands, as well as islands in Alaska, Hawai’i, California, Oregon, the tropical Pacific, and the Caribbean. Brad has published over 40 scientific articles on seabirds and the conservation of islands and has extensive involvement around policy issues related to the protection of island biodiversity and island ecosystems in the US and Mexico.